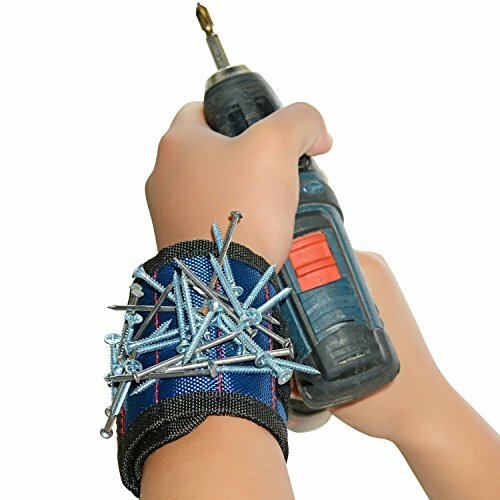 Magnetic wristbands are great for handymen who need to store small metal bits and screws on their wrists as they do repairs at home or on a construction site (Source). They effectively provide you a 'third hand'. Most of the magnetic wristbands we examined were weakly magnetized- the exception was the 9-magnet Magnelex wristband. Some buyers we spoke with said that magnetic wristbands make clambering up ladders much safer- the wristband functioning like a 'third hand'. A true hands-free solution- you won't need to shift around searching for a drill bit, risking a potentially fatal fall. It features adjustable Velcro- helping to fit most sized wrists. Let's take a look at 5 of the best-selling magnetic wristbands and see how they compare. 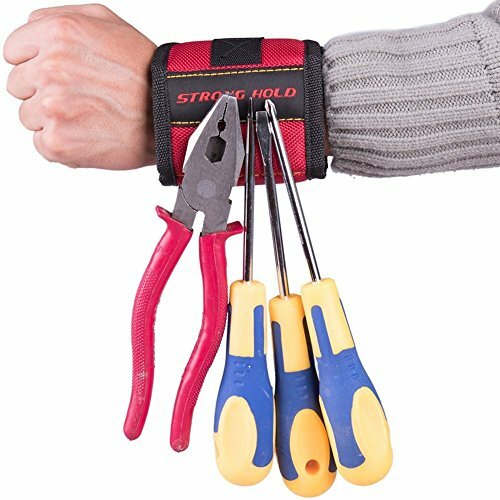 This magnetic wristband offered by MagnoGrip is comfortable, convenient and efficient for holding screws, scissors, and small tools. Users love the design and the size of the magnetic bracelet, but some do note that it can’t hold too many things. The wristband measures 9.5” x 5.5” x 1.3”, and it’s made of 100 % polyester. It features super strong magnets, a breathable design so that you can wear the bracelet all day, and a weight of 2.4 ounces. The size fits all wrists, and it’s ideal for woodworking and do-it-yourself projects. In general, users have a high opinion of the MagnoGrip wristband, and they praise the design, functionality, and usefulness. A buyer comments that he was skeptical about the quality of the magnetic wristband, but her husband liked it very much. She states that it’s a necessity for anyone who tends to drop or lose screws. Another customer mentions that the magnetic wristband is very handy and that it’s an excellent Christmas gift. The reviewer adds that he has a large wrist and that he initially thought that the band wouldn’t fit him. But it turned out that he even had some inches to spare. He highly recommends it to anyone looking for a magnetic wristband for nails. However, some customers have complained that the wristband consists of two magnets only and that they can hold only a couple of screws and nothing more. This super strong magnetic bracelet offered by Strong Hold is cheap, well-made and an excellent choice for every handyman. Users love that the bracelet can be adjusted to fit any wrist, but some do note that it’s bulky. The super magnetic wristband measures 4.5 x 3.5 x 0.5 inches, and it features powerful magnets which have been specifically processed for better performance, a weight of 2.4 ounces, and a one year warranty. The wristband is made of nylon for durability, and it has a padded mesh on the backside to allow free flow of air. It’s suitable both for men and women, and it’s available in red and blue. A purchaser says that the magnetic bracelet for nails is holding pretty well and that there are no signs of fraying. He adds that the magnets are strong enough for him and that the strap adjusts well. Another reviewer mentions that the super strong magnetic wristband can even hold his pliers and that it’s very handy and time-saving. The user states that the bracelet is a necessity if you don’t want to climb up and down the ladder. A buyer also comments that he bought three of these magnetic wristbands and that he finds them strong, well-stitched, and durable. However, some customers have complained that the magnetic bracelet will hold only a couple of nails and that it’s not suitable for heavier items. Some also complain that the magnets are not strong enough and that there are only two magnetic strips inside. If you need a third hand while working, you might want to take a look at this super strong magnetic bracelet offered by Aieternal. Users love the design and the adjustable strap, but some do note that it’s suitable only for small tools like screws and nails. The Aieternal wristband measures 4.7” x 3.9” x 1.1”, and it features embedded strong magnets that surround almost the entire wrist and a weight of 2.4 ounces. The bracket is made of double-layered ballistic nylon for durability, and this breathable design will allow you to wear this band all day. Moreover, the super strong magnets are excellent for therapeutic relief to your wrist. A buyer comments that this is the best magnetic wristband for screws and that it’s perfect for a DIY project. The user states that the bracelet turned out to be invaluable when he had to take apart his dryer and that the Velcro strap is well-stitched, durable, and comfortable. Another happy user mentions that he bought the super strong magnetic wristband for nails as a Christmas gift and that his father and uncle were both very pleased with its functionality and usefulness. The customer adds that the magnets are strong and that the magnetic band fits his wrist perfectly. Another purchaser shares that the bracelet is made well and that you can use it every day without worrying that you’ll lose nails or screws. However, a customer has complained that the magnetic area is too small and that he expected the magnets to be stronger. This magnetic wristband for screws and nails offered by Hitecere is well-stitched, durable, and suitable both for women and men. Users love that the bracelet is efficient and reliable, but some do note that the magnets are not as strong as they expected. The magnetic band measures 13.4 x 3.1 x 0.2 inches, and it features embedded magnets that surround almost the wrist, a weight of 2.2 ounces, and a one year warranty. It’s made of nylon, and it has a padded mesh at the back. The magnetic wristband can hold 175 ½ inch nails, 70 two-inch nails, 6o ¼ inch wood screws, and 20 three inch screws. A customer mentions that the band fits both her wrist and his husband’s wrist and that the Velcro strap is well-made and durable. She adds that the magnet is strong and the nails don’t fall when you move around. Another user comments that the band is perfect for woodworking, plumbing, and carpentry. The reviewer shares that this is the perfect gift for every handyman and that the magnet can even hold a few spoons. Another happy buyer states that the super strong magnetic bracelet is handy if you need to use a ladder and that it can hold even some light tools. However, some customers have complained that the magnets actually don’t go all the way around the wrist and that there is only a 3-inch section. If you tend to lose your nails and screws, you might consider this magnetic wristband offered by Magnelex. Users love that the band is comfortable and durable, but some do note that it doesn’t hold as many nails as they expected. The strong magnetic band measures 11.2 x 4.1 x 0.1 inches, and it features a wide magnetic surface, nine embedded magnets, a lightweight, breathable design, an adjustable top quality Velcro strap, and a weight of 2.9 ounces. The Magnelex band is made of high-quality polyester for durability, and one size fits all wrists. A buyer comments that she bought the Magnelex wristband as a Christmas gift for her husband and that he has been using it ever since with no complaints. Another reviewer mentions that he doesn’t worry anymore about searching for his nails on the floor and that the magnet is reliable. The customer adds that the bracelet arrived quickly and that it’s perfect for a DIY project. Another happy purchaser mentions that this is the biggest magnetic wristband he has encountered and that it can hold a lot of hardware. He also adds that the wristband is comfortable and safe to use around live power sources. However, some customers have complained that the magnet is not strong enough for large bolts and they had problems with the Velcro strap. Some also note that the wristband is bulky and limits your movements. The first magnetic wristband we took a look at was the MagnoGrip wristband- it's made of 100% polyester and is especially useful for magnetically gripping screws, small metal tools, and scissors. 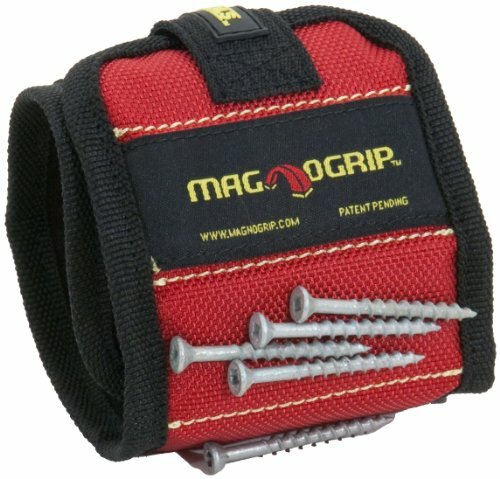 This magnetic tool wristband is advertised as your 'third hand'- great for home remodelers, woodworkers and professional contractors who need to keep certain metal items nearby. MagnoGrip also advises that they use ballistic nylon of that is double layered to ensure a particular a lightweight but rugged constructed wristband. An electrician told us that the Velcro makes it pretty adjustable- also if you have small or large wrists you'll be able to fit this magnetic wristband around them easily. It has seen some mixed reviews from other reviewers we spoke with- one plumber told us that when he purchased that he thought the entire band would be magnetized but instead he says that really only a small 2" x 2" portion of the wristband is actually magnetic. Another tradesmen complains that it is over-sized, which means that he has to wrap it around his wrist a couple times, which means that it ends up being bulkier than he would want on the job site. 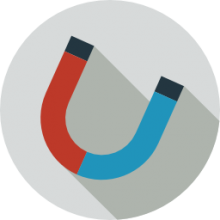 A home builder who we interviewed told us that he would compare the magnetic strength to that of a cheap refrigerator magnet- as he used it on the construction site he could only keep two or three screws at a time gripped to the wristband. The second option we examined was the StrongHold magnetic wristband- it's advertised as a durable magnetic tool holder that is an essential complement to the DIY handyman in your family. One reviewer says that the magnets are strong and that the Velcro adjustability help to form a tight grip on his arm as he used it. An RC plane pilot found that this magnetic wristband was a great way to hold assorted screws and nuts he needed to make on the fly adjustments to his prop planes. The last option we examine it was the Magnelex wristband- it's advertised as a convenient way to hold drill bits, screws, bolts, nails for carpenters, plumbers and home repairmen. It's manufactured to be a wider magnetic surface than other similar wristbands, enabling you to hold more items than you might expect. Other wristbands that we have examined only include two magnets whereas this one includes nine that are oriented in a way to hold the most number of items at a time. One buyer we interviewed endorses the extra-wide surface area of the magnetized pad- saying that it equips them to magnetically carry more hardware than other options they've seen. It's also pretty comfortable to wear with an adjustable Velcro to adapt to different sized wrists. One home owner purchased it for his uncle, saying that whenever he has ventured up a tall ladder, holding a hammer or drill, wearing this magnetic wristband on hand makes it safer for him to perform home repairs. 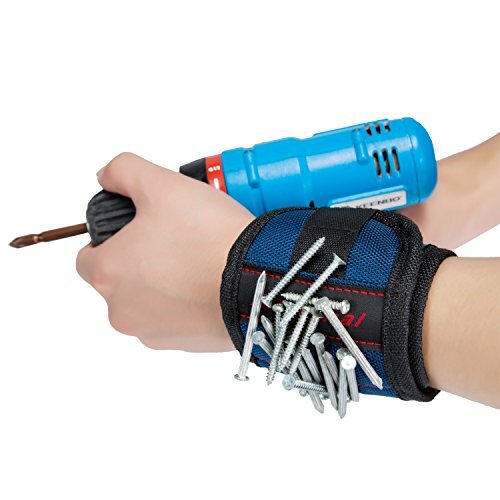 A satisfied wife who purchased this as a Christmas present said that her husband was constantly holding nails and screws in his mouth as he was doing a home repair task and he has quickly adapted to employing this wristband- saying that it is a convenient resource for his DIY tool-wielding purposes. One electrician said that in their experience it has been effective for gripping nails and screws however it doesn't hold onto aluminum or stainless steel items. One professional home contractor who also sidelines as an automotive repairman, constantly uses it, magnetically attaching washers, bolts, screws, nuts and any other small metal items onto his wrist as he tinkers with his latest mechanical project. Especially since these small fasteners and parts are so prone to disappearing or getting lost just as they are needed to finish the job, it has been amazing, he says, to discover this simple fix. As opposed to some other buyers that wish it were stronger, he actually likes the moderate strength of the magnets, saying that they aren't so strong that it's difficult to pry off the small metal parts he has attached to the wristband.